"The product was originally produced in Canada in clog-form," says co-founder Lyndon V. Hanson, III, vice president of Crocs. "We added a strap for utility, and gave it some flair." In June 2004, Crocs purchased Foam Creations and their manufacturing operations to secure exclusive rights to the proprietary foam resin called Croslite. The foam forms itself to a wearer's feet and offers purported medical benefits, according to a number of podiatrists. 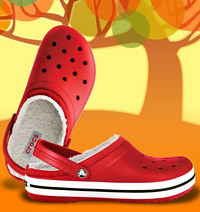 Crocs come in a variety of styles. The shoes are produced in a wide array of colors depending on the model. The Beach and Cayman styles are available in more than 20 colors; most other styles are produced in a palette of four to six colors or two-color combinations. Crocs are certified by the U.S. Ergonomics Council and the American Podiatric Medical Association. Some people claim that Crocs are quite possibly the ugliest but most comfortable shoes ever made. What the shoes lack in aesthetic value, they make up in therapeutic benefits. These shoes were designed specifically to eliminate plantar pain and achy feet. They also help people with injured feet, bunions, and diabetes. 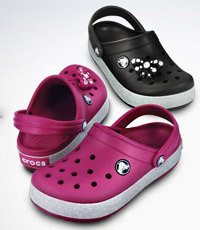 Crocs have many famous fans like Nicole Appleton, Jack Nicholson, Al Pacino, Matt Damon,George W. Bush, etc.